It is resistant to fading, cigarette burns and damage. The vulcanized surface of flooring ensures that it is virtually impossible to wear through. Environmentally friendly in both its manufacture and recycleability. Slip Retardance and Safety: Compared to other floorings like normal carpeting, wooden or marble floors, rubber matting is very slip retardant. 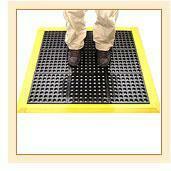 It can prevent the risk of slips and falls in high traffic areas. This type of flooring is recommended for floor coverings in areas such as ramps, restrooms and concourses. Comfort and Noise Reduction: This type of flooring is more comfortable to stand and to walk compared to other hard surface flooring. It minimizes the noise created by footsteps and wheeled traffic and acts as anti-fatigue flooring due to its softer rubber base. Maintenance: Matting requires less maintenance in comparison to most other hard surface flooring. This type of flooring is scratch resistant and can be easily cleaned with any ordinary detergent and waxing, polishing or scrubbing are not all required. Variety: A wide variety of flooring is available. There are plain designs, checks and stripe patterns, abstract patterns as well as designs that give the look of granite, marble, chips etc. These are available in a variety of colors and can change the look of the entire room. Transit flooring: Transit flooring is another variety of floor covering which is used in buses and trains which are available in various designs.